Syndergaard & Strasburg go toe to toe in a heavyweight exchange. The Mets host the Nationals at CitiField today after sweeping the Marlins in Miami, then traveling up to New York for a 1:10 PM to play two games within 24 hours. While Syndergaard hasn’t given up a hit yet, he did give up a run early when Wilmer Difo laid down a safety squeeze in the second, putting the Nationals up by one. Noah only gave up two runs on one hit, however he struggled to find his command and just wasn’t as sharp as we’re accustomed to seeing while still retiring 12 in a row at one point. Wilson Ramos would get the first hit of the game for either side to lead off the bottom of the fifth inning. After McNeil grounded into a force out, Rosario would reach on an error committed by Anthony Rendon at third. Unfortunately, Strasburg would strike out both Juan Lagares and Noah Syndergaard to end the fifth. 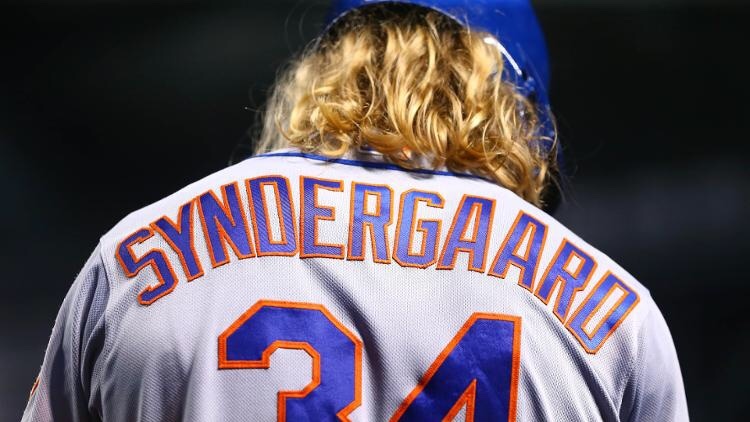 Syndergaard, who gives up a home run 1 every 68 at-bats, which is the best in the Majors, would give up a lead off homer in the sixth to rookie centerfielder Victor Robles. The home run would give Washington the 2-0 lead in the middle innings. Syndergaard would end up pitching 6 innings, giving up 1 hit, 2 runs, walking two and striking out six. McNeil and Rosario would both strike two-out singles in the seventh, forcing Strasburg out of the game for the match up of Nationals reliever Matt Grace and Pinch Hitter J.D. Davis. However, Davis would get caught looking to end the inning. The Nationals relief core would shut the Mets down the rest of the way, unfortunately. Nationals closer Sean Doolittle would come on in the bottom of the ninth to close the game with the Nationals winning 4-0. The Mets will send Steven Matz to the mound on Saturday after a day off on Friday, Matz will go head to head with fellow left handed pitcher Patrick Corbin at 1:10 PM.